Round 5 starts next Tuesday 23rd April 2019 and must be played by the ends of May. Please arrange with your opponent as soon as possible. The draw for the last round will be done at the club tonight. Any games not played will be defaulted. to night is the last chance to play them. At the recent SNCL Round 7 at the Carnegie Conference Centre, Dunfermline on Sunday March 24th 2019, the Dundee City A team were crowned national champions. Also the Dundee City C team gained promotion to Division 3. For a full report see next post. The competition for prizes, promotions and relegations reached a climax at this year’s final Round. Dundee City was represented this year by 4 teams. As in previous years the participation of our chess teams is a joint venture between Castlehill Chess Club, Dundee and Dundee Chess Club. Unfortunately for Dundee City teams we had a few call offs for Round 7. These were sufficiently serious that for the first time in 7 years we were only able to field 3 teams instead of 4. The effect of team changes and reorganisation significantly affected the strengths of 2 of the 3 teams. The Dundee City A team were unaffected and fielded an unchanged team as they attempted to defend their Championship title. Although the B team was weakened the greatest impact of the call offs was on the C team who were leading Division 4 by one point going into the last round. It was with great regret that we had to default Dundee City D. In Division 1, Dundee City A are the defending champions and were in top spot. They faced the very strong Edinburgh 1. After all the struggles and ups and downs to win their first title last year, Dundee City A made the title defence look easy after an emphatic win by 4.5 -0.5. Andrew Greet was held to a draw by FM Gheorghiu but the rest of the team all won their matches. This was a magnificent achievement and many congratulations should go to the team of Andrew Greet, David Findlay, Andrew Wright, Stephen Hogg and Declan Shafi. In Division 2, Dundee City B were sitting mid-table and had had nothing to play for except their pride. Unfortunately they lost to probably the strongest team in the Division, Wandering Dragons A, led by IM Mark Orr, with only Alastair Dawson saving the whitewash! The score was Wandering Dragons 4½, Dundee City B ½. So it is another season ahead for Dundee City B in Division 2. Division 4. Dundee City C were up against a strong Corstorphine and were handicapped by a much weaker side than normal. In one sense it proved too much in the end as they lost the match and the chance of finishing champions at the last hurdle! However, there was a twist in the tale because one of our promising Juniors, Max Whisson J13 (974), won his match against an 1188 on board 4. What a result Max! Then, Ray Noble (1482) on board 1 managed with the black pieces to get a draw against Alistair MacNaughton (1810). It was a fantastic result and huge congratulations should go to Max and Ray as well as the rest of the team (Ed Walton, Cameron Wilson and Ramit Kanodia). The effect of this loss by 1.5 – 3.5 was that the C team slipped down into 2nd place but results elsewhere meant that they stayed there once Round 7 was completed. This means that, against big odds, the Dundee City C team was now promoted to Division 3. All in all this 2018-19 SNCL campaign went very well indeed. A big thank you to the SNCL organisers for a great tournament. Thank you to all our players, captains and parents for their support and last but my no means least, Alastair Dawson for all the hard work he has put in to make sure Dundee City teams (Castlehill Chess Club & Dundee Chess Club) turned up and could take on the other teams with a full complement of players. 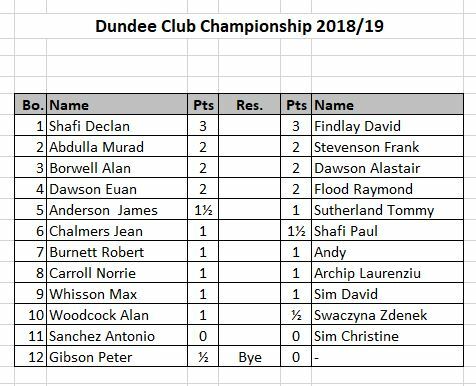 Going into Round 5 Declan Shafi and David Findlay lead the Dundee Club Championship. A hard fought draw between them in Round 4 leaves them in joint lead on 3.5/4. Close behind on 3 points are Alastair and Euan Dawson who beat Alan Borwell and Ray Flood respectively. Murad Abdulla can join them on 3 points depending on the outcome of his game against Frank Stevenson. The above players are closely followed on 2.5 points by Jim Anderson after his win over Tommy Sutherland. Dundee A have progressed through to the semi-final of the TAFCA Knock Out Championship beating Castlehill D 6-2. They now face the University of St Andrews in the Final. Here is the Draw for round 4 of the Club Championship. Starts 12th March. must be played by 9th April. Wednesday 27th March: TAFCA Allegro Championship, Round 6, Kirkcaldy (note new venue). After the festive break, battles resumed once again for our 4 teams in the penultimate day at the Carnegie Conference Centre, Dunfermline. At present the A team is challenging for the national title, the B team is battling for promotion from Division 2 into Division 1, the C team presently in Division 4 is a contender for promotion to Division 3 while the D team, composed mostly of Juniors, is having its first year of competition. In the morning in Division One, Dundee City A started with a hard-fought draw against Edinburgh West (2½-2½) with remarkably all matches being drawm. It could have gone either way but the A team, consisting of Andrew Greet, David Findlay, Andrew Wright, Declan Shafi and Stephen Hogg, all performed excellently. In Division Two Dundee City B suffered against Forth Valley A losing 4½-½, with Ben Volland stopping the whitewash! In Division Four, by contrast, Dundee City C faced the league leaders, Dunfermline B and won convincingly. Paul Shafi on board 1 lost, but Keith Rose, Raymond Flood, Ray Noble and Ed Walton all won to give Dundee City C an excellent 4-1 win to go top of the league! In the same Division, Dundee Juniors + newbie Marten Kats won 3½-1½ against Hamilton B, but it was a disappointing match with Hamilton B defaulting on two boards causing Marten Kats and Krish Akula not to have a game. All teams that default boards in this way are fined by the organisers – it is always extremely disappointing when players make the effort to travel to the venue, sometimes from considerable distances away across the country, only to find out that some members of the opposing team have failed to arrive. The afternoon matches in the afternoon Round 6 were also tightly contested. In Division 1, Dundee City A achieved a remarkable success after beating the highly-rated Bon Accord A by 4-1 to end the day in top spot (10 points) and 2 points ahead of their nearest rivals. With only one match left the ball is in their court to make it back to back national titles! They will face 3rd placed Edinburgh 1 in the last match. Edinburgh 1 are an exceptionally strong team and Dundee A will have to achieve at least a draw in this last match if they are to gain the national title. In Division Two, Dundee City B just did not have the best of days as they again lost, this time to Wandering Dragons B, 3½-1½. The “B” team were missing Alastair and Euan Dawson due to Euan turning 18 (Happy birthday Euan from all your chess friends and also well done in passing your driving test!) and having a family bash in St. Andrews! Even so it was a disappointing day and probably means that the B team next season is consigned to another year in the Second Division. They face league leaders Wandering Dragons A in their last match. Mathematically there are possibilities but…..
By contrast, the Dundee City C team excelled themselves in Division Four winning their 2nd match of the day against CS Bos 2 to guarantee top spot. The C team was helped by CS Boss 2 only having 4 players which meant Ed Walton missed out on a match. Ray Noble won his 2nd matchof the day to make it 2-0. All we needed was 1 point out of the remaining three matches. How hard could that be? Well Ray Flood lost to give CS Boss 2 some hope. At one point Paul Shafi on Board One seemed to be struggling and Keith Rose on Board 3 had a balanced position that could swing either way. Would he checkmate, or would his opponent promote his pawn? In a titanic struggle Keith Rose prevailed for Dundee City C in a nail-biting finish to not only secure the win for the team, but make sure we finished top of the Division by one point with one match left to play. Great play Keith – a Captain’s performance! In the end Paul lost his second match but this result did not matter. Division 4 champions and promotion are up for grabs on the last day of action on the 24th March! I do not know for sure but it looks like Dundee City C will face Corstorphine who sometimes turn up with the strongest side in the Division ( Board 1 1810; Board 2 1595 etc.) and other times not (e.g. Board 1 1596; Board 2 1222 etc.)! Let’s hope it’s the latter or we could have our work cut out! In the same Division, Dundee City Juniors fared less well in the 6th round losing 4½-½ to Dumfries & District B. Outgraded and outgunned they put up a fierce battle and the talented Rishabh Akula managed a great draw against a 1252! The experience gained by playing at this level will help all the Juniors develop their skills and will benefit them in the long run. Reminder club championship started last week. Due to league matches and TAFCA Allegro taken place at our club on th 26th I’m extending the deadline to play the games till 5th March.